Home Activities Projects Think Palestine: Boycott Israeli Dates this Ramadan! Five things you can do. Join the struggle for Justice. Are you breaking your fast with the Occupier’s date? *The UK is Israel’s second largest market for dates. Download and share this leaflet with your family and friends. The text of the leaflet can also be found below so share this page too. Distribute hard copy leaflets amongst friends and family and in your community. Contact Inminds here and request hard copy leaflets which will be sent to you free of charge. Watch and share the video of Massoud Shadjareh explaining why concerned citizens should boycott Israeli dates. 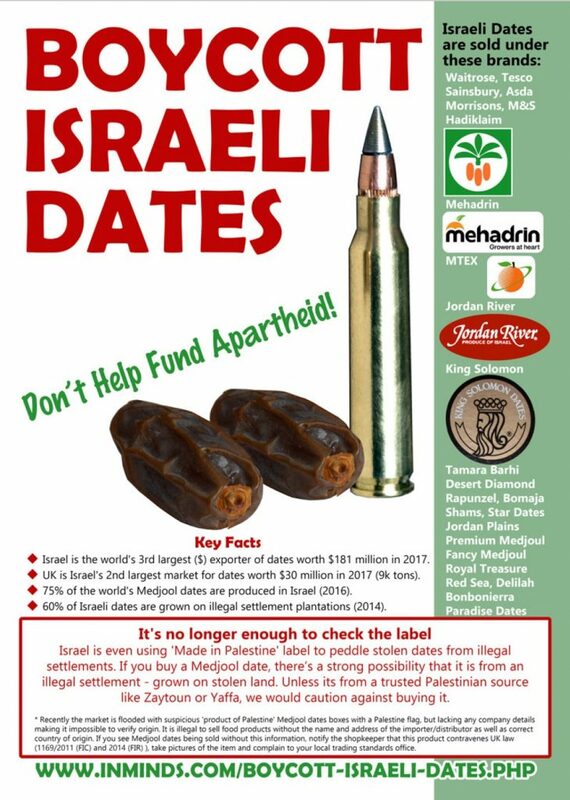 Buy Palestinian dates from the IHRC Shop here and other stockists. Share details of the Inminds campaign. Source: Inminds.com Download the leaflet here. Israeli settlements built on stolen Palestinian land have been ruled illegal by the International Court of Justice. 60% of Israel’s dates are grown in these settlements, it’s their most profitable crop contributing significantly to their economic viability. 80% of settlement dates are exported, the UK being Israel’s 2nd largest market. If you oppose the settlements, target their dates. Picking of the dates is hard work, Israeli settlers bring in low paid Palestinian labourers to do this back breaking work. During the pruning season, workers are dropped on the date palm trees by a hoisting crane at Sin the morning, left perched on palms that soar to heights of 12 metres – a 4 storey building, left there swaying in the wind for up to 8 hours without even a toilet break, with no means to come down until the crane returns at the end of the day, the workers cling to the tree with one arm and work with the other to meet their quota. If they fall behind they will lose their jobs. The Israelis prefer to employ children — even issuing official work permits, as they can climb trees faster, work for less and it’s easier to cheat and humiliate them. Out of desperate poverty Palestinian families are forced to take their children out of school and hand them over to the settlers to work for a pittance. Guilty Companies Hadiklaim, the Israeli Date Growers Cooperative, which includes illegal settler plantations, sells 65% of all Israeli dates. Its brands include Jordan River, King Solomon, Tamara Barhi Dates, Rapunzel, Bomaja, Desert Diamond, Shams and Delilah. They also supply supermarkets who market them under their own brand. These include Marks & Spencer, Sainsbury’s, Tesco, Asda, Morrisons and Waitrose. Sometimes they are labelled “produced in the West Bank”, but these are not Palestinian dates. Mehadrin, Israel’s largest fresh produce exporter, boasted of doubling their Medjoul date sales sighting strong demand in Ramadan! Their dates have brand names Premium Medjoul, Fancy Medjoul, Royal Treasure, Red Sea, & Bonbonierra. Sometimes their packaging states “Grown by Palestinian Farmers”, this refers to Palestinian ‘slave’ labourers found on Israeli plantations. Tnovot Field(Field Produce Marketing Ltd), is Israel’s 3rd largest exporter of Medjool dates. Its brands include Paradise dates, and Star dates. 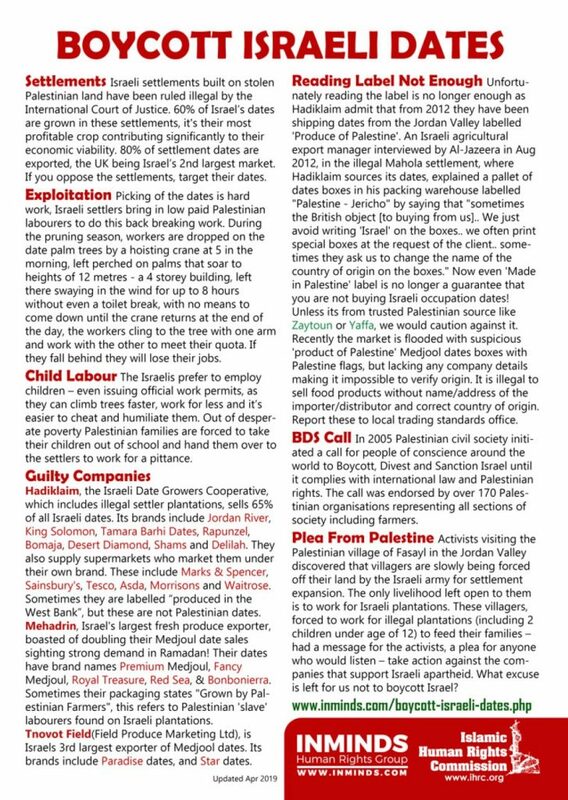 Unfortunately reading the label is no longer enough as Hadiklaim admit that from 2012 they have been shipping dates from the Jordan Valley labelled ‘Produce of Palestine’. An Israeli agricultural export manager interviewed by Al-Jazeera in Aug 2012, in the illegal Mahola settlement, where Hadiklaim sources its dates, explained a pallet of dates boxes in his packing warehouse labelled “Palestine – Jericho” by saying that “sometimes the British object (to buying from us].. We just avoid writing ‘Israel’ on the boxes… we often print special boxes at the request of the client… some-times they ask us to change the name of the country of origin on the boxes.” Now even the ‘Made in Palestine’ label is no longer a guarantee that you are not buying Israeli occupation dates! Unless its from trusted Palestinian sources like Zaytoun or Yaffa, we would caution against it. Recently the market is flooded with suspicious ‘product of Palestine’ Medjool date boxes with Palestine flags, but lacking any company details making it impossible to verify origin. It is illegal to sell food products without name/address of the importer/distributor and correct country of origin. Report these to local trading standards office. 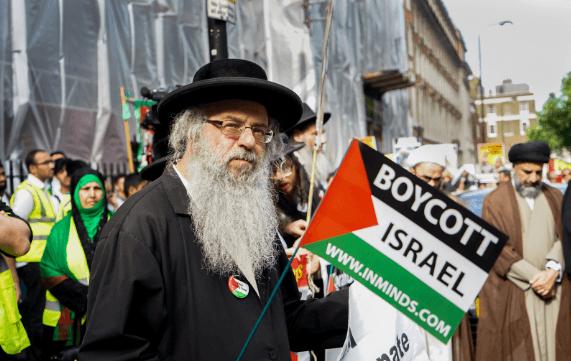 In 2005 Palestinian civil society initiated a call for people of conscience around the world to Boycott, Divest and Sanction Israel until it complies with international law and Palestinian rights. The call was endorsed by over 170 Palestinian organisations representing all sections of society including farmers. Activists visiting the Palestinian village of Fasayl in the Jordan Valley discovered that villagers are slowly being forced off their land by the Israeli army for settlement expansion. The only livelihood left open to them is to work for Israeli plantations. These villagers, forced to work for illegal plantations (including 2 children under age of 12) to feed their families —had a message for the activists, a plea for anyone who would listen — take action against the companies that support Israeli apartheid. What excuse is left for us not to boycott Israel?